Article by Kjeld Malthe-Bruun, Sau og Geit (Norwegian magazine), no. 4, 1997. What kind of meat do the consumers really want? In two earlier editions this year, we have had articles where different aspects of the breeding program on spælsheep have been discussed. Here is yet another example of how this subject has sparked the interests of our members: This time one of our Danish readers, Kjeld M. Bruun, has sent us his contribution to the debate. Bruun himself is a sheep owner and, among other things, keeps spælsheep on an abandoned island in Kattegat. He is engaged in ecological sheepfarming and knows our sheepfarming from working in a gathering-team in the Ryfylkeheiene, (Norwegian West Coast Mountainstimes of old). A central question in his article is - what kind of meat do the consumers really want? 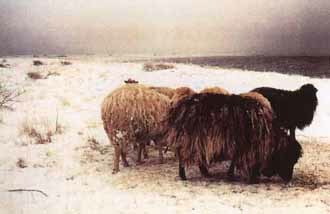 Today Denmark has 80-90,000 over-wintering ewes, and these are mainly heavier meat-breeds. Some sheepfarmers have, however chosen short-tailed sheep, like the Spæl, Gotlans Pelt and Finnish Landrace. 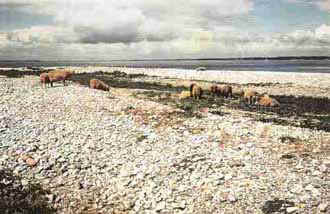 In total, approximately 20 different species of sheep are represented in Danish sheepfarming. EU`s new system of classification has seriously prodded the Danish sheepfarmers. In the latest edition of the magazine Dansk Fåreavl (Danish Sheep Breeding) there have been numerous articles about breeding, breeding-goals, content of muscles, requirements from the slaughterhouses, retailers demands, consumers demands etc. etc. The small, short-tailed breeds are described almost as a problem. Does animal welfare mean something for the consumer? Humans have since times of old designed livestock and developed more productive breeds. But does the consumer really know what is going on? More and more people live these days in urban societies and have therefore lost the feeling of our animal’s way of living. At the same time, a considerable ecological production has emerged over the last decades. In Denmark, the Parliament decides the criteria for how to do this. At the same time as the increase in the ecological farming, consumers have become more and more skeptical to the methods of production in Danish agriculture in general and ask more and more questions. In the ecological concept there is among others things the idea of bringing the consumer and the product closer together. This is necessary to be able to argue for higher costs, and therefore higher prices in ecological farming. One could imagine that this dialog between producer and consumer becomes so good that, for example, there would be high demand for lamb meat from spælsheep. 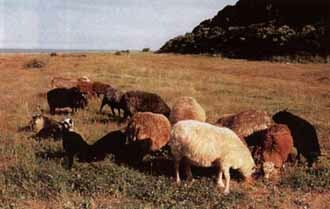 This require that the consumer obtains a good knowledge of certain ecological connections, for example that the lamb of spælsheep have special qualities regarding utilization of an island in Kattegat or a marginal pasture on the West coast. 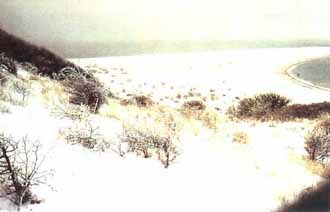 The spælsheep is better adapted to the mountains, rather less so to the slaughterhouses. Seen from an ecological, view the short-tailed breeds have considerable advantages. In my opinion they are in general better ecologically adapted to nature compared with the meat-producing species. They are frugal, and manage therefore better on marginal grassland compared to the heavier species. The spælsheep, simply put, is well adapted to the moors, but worse in the slaughterhouses. In Denmark’s conventional agriculture the consumer gets little or no real information. The EU, the slaughterhouses and the retailers are only interested in standardization, and even claim that this is a demand from the consumers. The question about this is right. Informed consumers will probably, to an ever-increasing degree, ask for different types of meat from lamb for different prices. Is increased production the only way? Since the beginning of time we humans have designed our animals to increase the production – this continues unabated to the present day. The beautiful new world with genetic manipulations and cloning at the door, leads to uniformity. In the Bible, as we know, is says "Fulfill the earth, make you to the lord of it and rule the sea, the fish and the birds of heaven, the cattle and all wild animals living on the earth" One could be tempted to believe that our contemporary desire to manipulate and our points of view on animal welfare arose from this – at least it legalizes our human ambitions. The ecological concept puts a considerable damper on the ambitions. But is not ecology only an expression of being a reactionary? Who are the rules made for? The spælsheep or the designer? This is in no way indifferent. For example, the long-tailed species can easily and elegant get their tail cut off, also in ecological farming! Ecology and humanism seem to be two different matters. Nevertheless, the designers are ready for new challenges, whenever the consumer demands, and then one breeds like crazy. This could, to exaggerate a bit, result in that the sheep has to be carried up to the moor – an unfortunate ecological adaptation. The spælsheep are still well adapted ecologically. Instead of breeding it away, trying to keep up with the meat-producing species, one could use energy, inventive skills and money to tell the consumer what one produces and why. The keywords are declaration of the products, certification and last but not least credibility. In Norway "the wildsheep" and "meat from lambs above the tree line" are small actions in this direction – actions that will succeed if the consumer is involved. Conclusion: Our spælsheep deserve a better destiny then ending up in the hands of our future designers.